Luxury Homes for Sale in Phoenix Arizona offer interesting and unique home styles and designs. From Traditional to Contemporary there is a luxury home to fit just about every luxury home buyers taste. Many Phoenix Luxury homes for sale also have stunning outdoor patios and pools. You'll want to take a close look at Phoenix Luxury Homes For Sale July 2018.For your convenience there is a link below to search for luxury homes with pools or without pools by clicking on the links below. Phoenix Luxury Homes For Sale July 2018: - Current availability of Phoenix Luxury Homes this month is 386 homes for sale. These luxury homes are priced from $700,000 to $7,450,000. There are 98 Phoenix Luxury Homes pending, waiting to close and 83 Luxury homes have closed this past month. With a higher price point, Phoenix Luxury Homes for sale typically take longer to sell than other homes in the Phoenix Metro area. Buyers will most like find price and terms are negotiable. 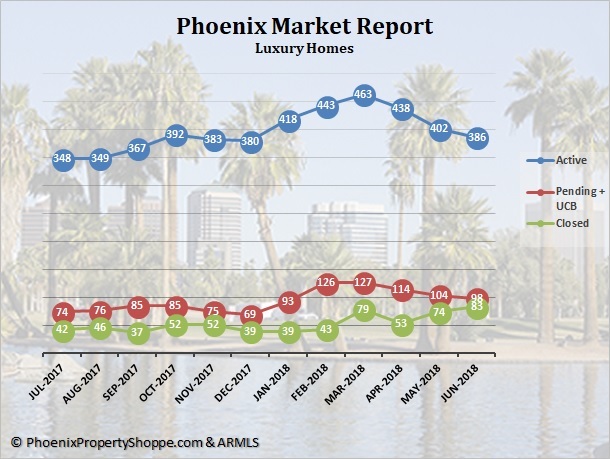 Thus far in 2018 there have been 371 Phoenix Luxury homes sold, with prices ranging from $665,500 to a high of $4,100,000, with an average price of $1,104,755. Average days on the market was 124 with the shortest days on market being 1 day. For these 371 homes, the sale price/list price ratio was 96%. Because there is frequent change in the inventory of Phoenix Luxury Homes for Sale, if you would like to track this market, let us help. We will set up an on-going search especially for you, with your own customized web site. You'll be notified as soon as new listings are posted. And when you see something that interests you, please give us a call – we would love to schedule a showing for you at your convenience. Are you Relocating to the Phoenix Area? Buying a Phoenix home can be a smooth and stress-free process as well as enjoyable! If you are considering a move to Phoenix we would be honored to represent you as your Exclusive Buyers Agent. Along with my husband, Gary we have a combined 40+ years of knowledge and experience which will benefit you greatly. Give us a call today and discuss your real estate goals and dreams.